I’m grateful to live in a world full of convenience when it comes to food. It’s not like it was for people in generations before me who had to do mostly everything by themselves when it came to putting a meal on the table. I can admit that I take that for granted. These days, if you want something, you can usually go into the grocery store and buy it, or go to a restaurant or fast food joint to eat it. Such are the conveniences of living in a first world country. Breakfast foods are one of those things that I think most people would rather be able to buy in a store or restaurant rather than put in the effort to make themselves. Who can blame them, really? If you have to wake up and be at work by say 8 or 9 in the morning, you may be in the mood for pancakes or french toast but you’re probably not going to feel like waking up super early to make them and still be on time to your job-especially if you have kids to get ready for school on top of that. Sometimes I wake up in the morning craving a honey butter croissant- I’ve never woken up craving one and actually attempted to bake it before I had to be where I needed to be in the morning. Nor am I likely to ever try. I usually just resort to the ease of store bought or restaurant made method when I want something for breakfast. If I want bagels, I’ll buy a bagel. If I want pancakes, I’ll go to a restaurant to eat some. If I want a breakfast sandwich, I’ve always just went out to the store to buy the ingredients to put it together, or just picked one up through a drive-thru. Until now, that is. This time was different. Sometimes, I’ll be flipping through one of my numerous cookbooks and suddenly come across a recipe that at first glance, I may think: why on Earth would I make that for myself, when I know very well that I can go out and buy it at the store? What a waste of time. That was what basically happened with these English Muffins. I bought this huge, beautiful cookbook called “Bake” that features regional recipes from around the world and was looking through it to choose a recipe to make and I stumbled across this one. I’d never seen how they were made before and when I saw that it looked relatively easy, I began thinking about giving it a go for myself. To make them a little healthier, I substituted whole wheat flour in the recipe and I think it gives the bread a nuttier, heartier flavor. Was it a necessary recipe to make? No, but it was a lot of fun. It also made me decide to go a step further and throw together the ingredients for a full on breakfast sandwich- recipe is soon to follow. I hope you guys don’t mind me bringing whole wheat English Muffins to this week’s Fiesta Friday- I wouldn’t mind if they just get pushed to the back of the table while you guys smash on some ‘less healthier’ options. I swear they taste great toasted and smeared with butter and jam though! 1. Mix together the flour, yeast, salt and baking soda in a large bowl. 2. Add buttermilk and water and mix to combine. Turn out onto a floured surface and knead until smooth dough forms. If it is too wet, add a little flour. Transfer to a clean bowl, cover with a damp towel, and let rise for about 2 hours. 3. Turn dough onto a lightly floured surface and roll out to thickness of 1/2 inch. Use a 3-inch round cutter to cut out 8-10 circles, rerolling the trimmings, if necessary. Do not overwork the dough. Sprinkle the circles with fine cornmeal and let rest for 1 hour. 4. Put some oil into a flat griddle pan or heavy skillet and het over medium heat. Add the muffins to the pan, in batches, and cook on one side for about 4-5 minutes, until golden brown. Turn and cook on the other side for 4-5 minutes, until golden brown. Place the cooked muffins on some paper towels and cool before serving. Healthy and yummy! Glad you brought these Jess! I love these! They are sooooo versatile. 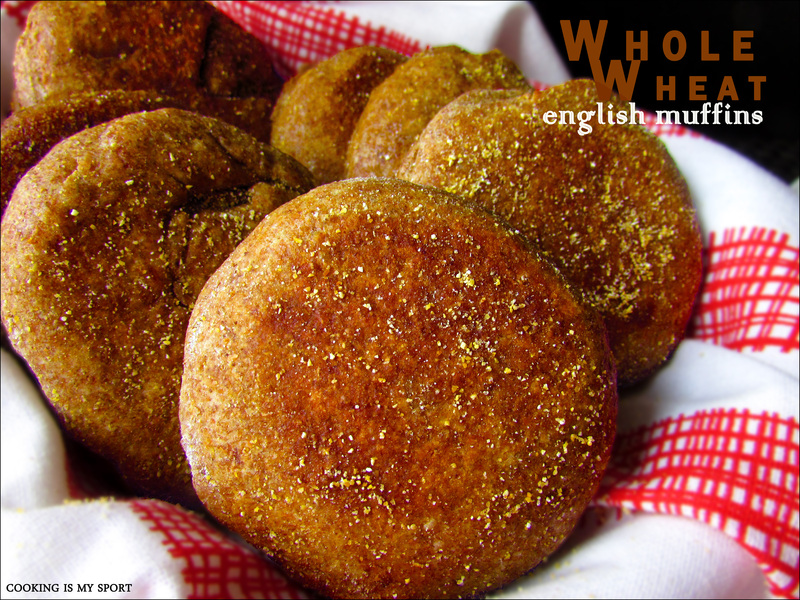 I’ve never thought of making my own english muffins, these are a great idea! I’m glad you brought them to the party! Jess, these are a wonderful addition to the party! Andrea is right – you should add some herbs to them and submit them for the yeast challenge – there’s only a couple of days left to enter, though! Happy Fiesta Friday! Those look awesome! Love that they are whole wheat. 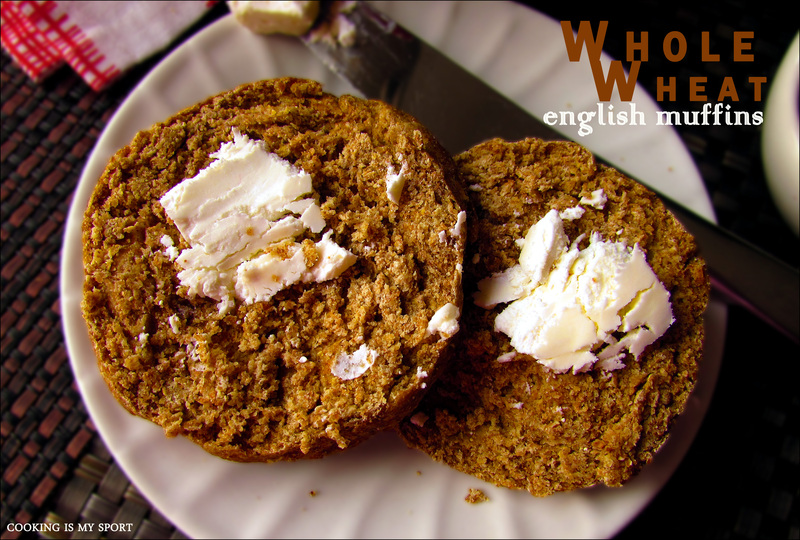 I have never made English muffins but it sounds like something that would be fun to try! Whole wheat bread is my staple too, and these didn’t disappoint- thank you! It is really simple, and I love that they taste just as good as the store bought version. Thanks apsara! Posted	 May 23, 2014 at 7:38 pm by Ngan R.
These look delicious, Jess, and I for one appreciate the non-sweets brought to the party. I like that you used whole wheat bread. I know what you mean about the convenience of buying food rather than making it yourself. That’s why it has taken me years to start to learn to make bread (why spend the time when other people have perfected that art?). 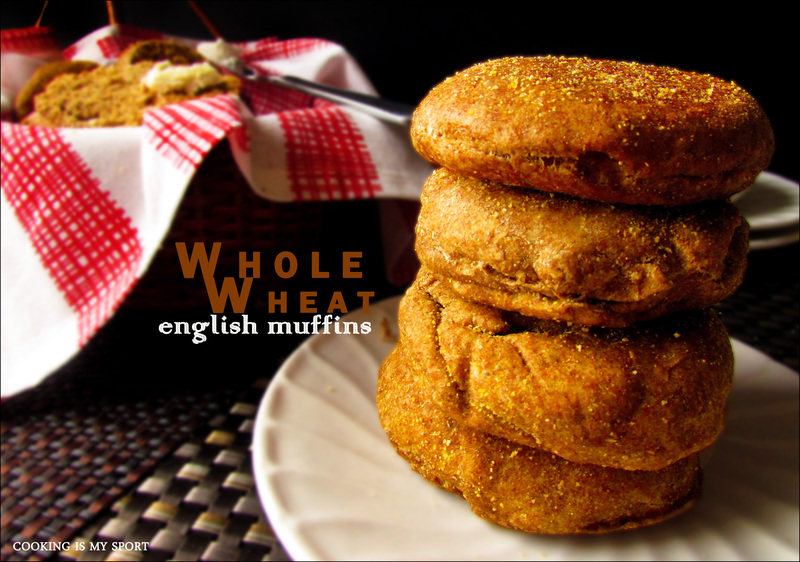 I am going to have to add your whole wheat muffins to my to-try list! Posted	 May 24, 2014 at 5:15 pm by Ngan R.
Jess! I am a person who doesn’t mind waking up earlier in the morning to prepare breakfast. Apart from breakfast is the most important meal of the day, breakfast is my favorite! I would do anything for breakfast. I admit that there are times that I prefer to eat out when I know that I am ready to make that specific food (because I failed once) – like hashbrowns!! 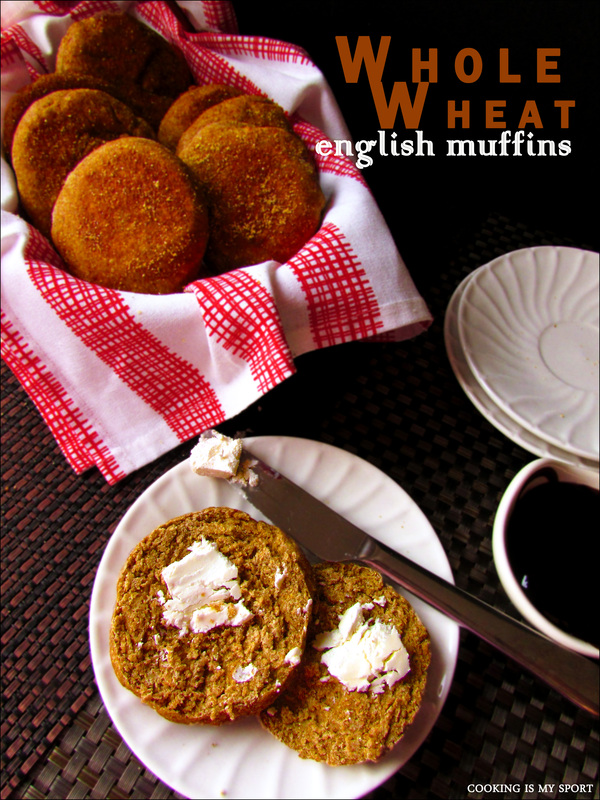 Anyway, let’s talk about these Wholewheat English Muffins… This is very creative! I’ve never tried or even think to make my own. 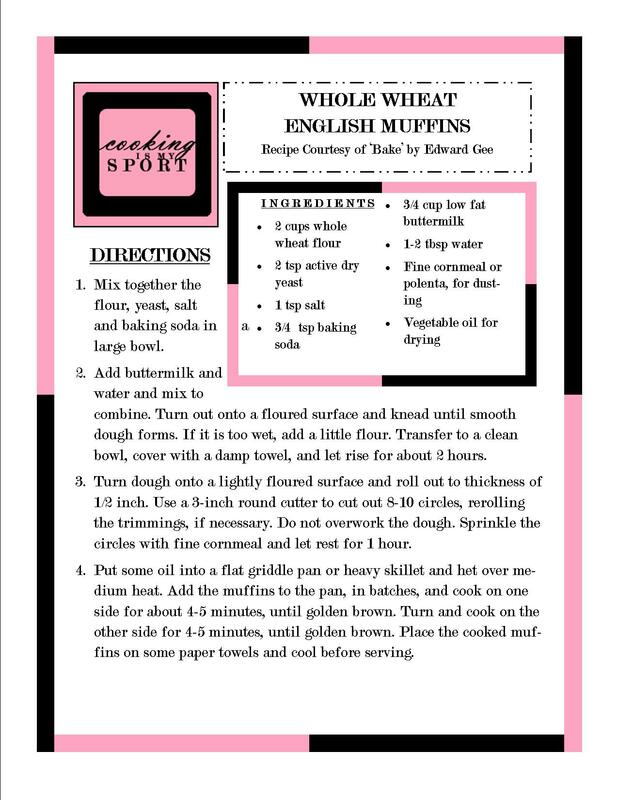 And making whole wheat is really good! Of course, we will not set these aside. I love how party goers brought healthy treats for today’s FF. These look fantastic, and no sugar. These Friday Fiestas, they give me so many new ideas to try. Jess, what a lovely thing to bring to the party! I made English muffins once, but they weren’t half as pretty as yours…Thanks so much for snaring! These sound so good, and I love whole wheat breads! This looks great, Jessica. I recently tried baking whole wheat herb bread but unfortunately, it didn’t rise. While my family did like the result as it reminded them of herbed naan and parathas, I am learning that whole wheat needs to be treated differently than all purpose flour. Yum Yum yum 🙂 And I don’t have to worry much about the calories too. yum yum yum! So much healthier than the shop brand ones! You have great pictures, they capture the mood and taste of these muffins.